New book, 367 pages. 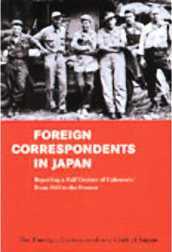 Since its founding in 1945, the Foreign Correspondents Club of Japan has been a haven for working journalists. Club members, who include several Pulitzer Prize winners, have personally witnessed and reported on some of the most momentous events of the last half century; the end of WW2 and the occupation of Japan; the revolution in China; the Korean War; Vietnam and the student riots of the 1960's; the Cold War; Japans economic miracle and the subsequent collapse of the 'bubble' economy; the death of Emperor Hirohito, and much more.